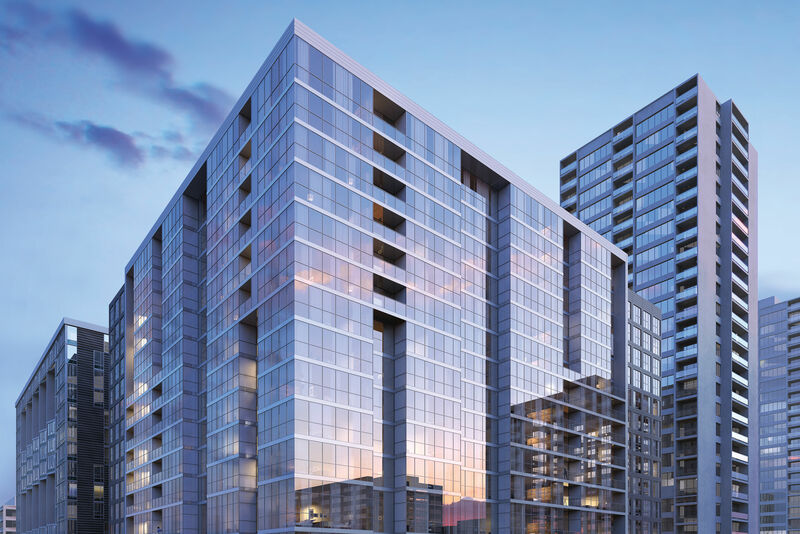 A Southeast couple revives the Queen Anne lifestyle. 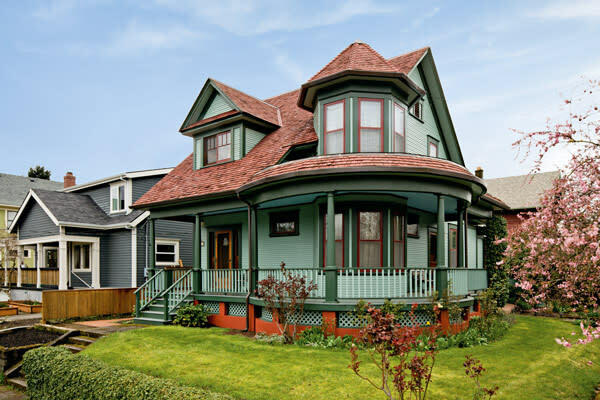 The wraparound porch and two-story corner tower are hallmarks of the Queen Anne architectural style. The deep green of the exterior reflects the Victorian love of nature. Heavy, hand-stitched velvet curtains usher guests into the blue-accented dining room. “The color blue was supposed to aid with digestion,” says Audry. The Bonds weren’t always antique aficionados—nor were they friends of ghosts. 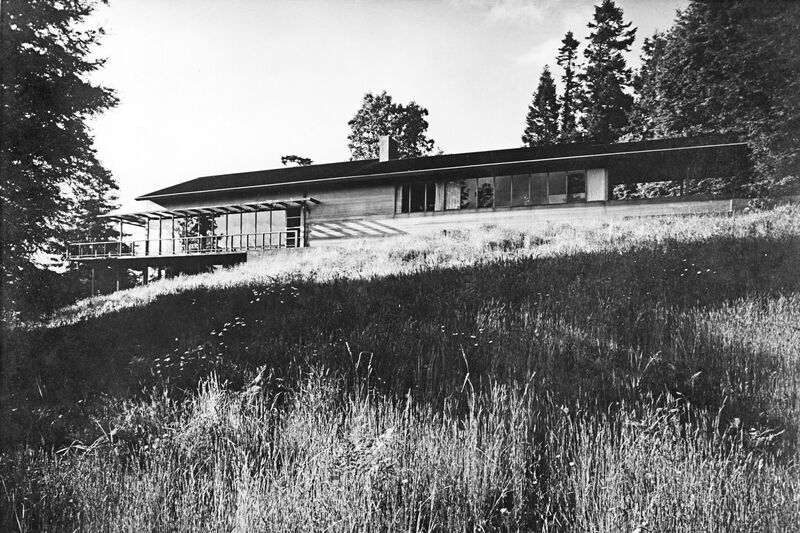 In fact, Audry had to be talked into buying the home. “I hated it at first,” she says bluntly. 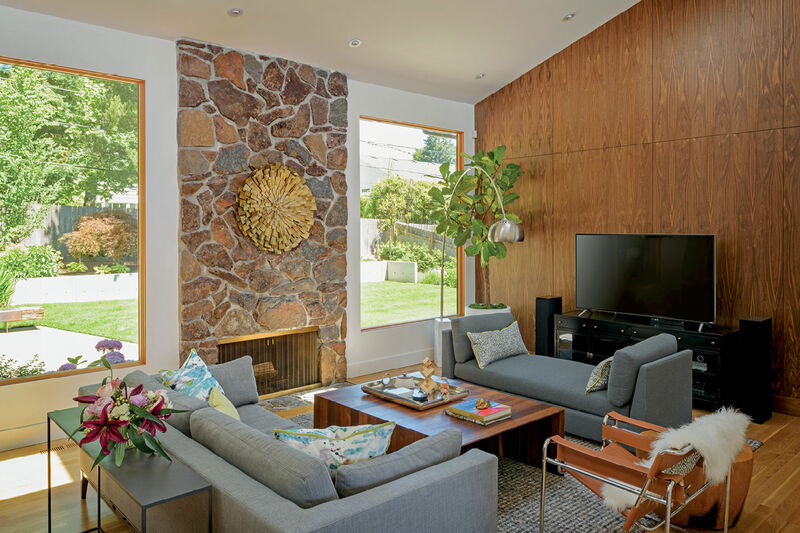 When they were house hunting, her dream was a larger version of the 1927 Spanish Colonial–style home they were selling, but the price was right and the neighborhood (just off of SE Belmont Street) was appealing. They also appreciated the fact that little of the Victorian’s architecture and layout had been altered, leaving them with a well-preserved slice of time to work with. The Bonds’ living room is a perfect example of Victorian style, with its layered textiles, rich colors, and antique furnishings, like the upright piano made of rare Cuban mahogany. They gave away their furniture—Scandinavian contemporary pieces in pastels—and started anew. 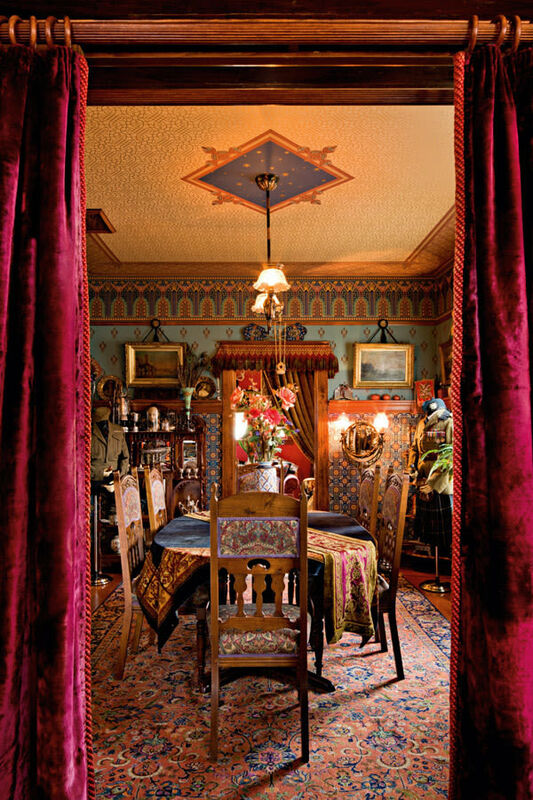 Neither Audry nor Chris had any background in historical renovations other than a passing interest in antiques, but they immersed themselves in Victoriana. “We’re both meticulous people,” says Chris. “So we didn’t want reproductions; we wanted the real deal.” The couple spent weekends trolling vintage stores and poring over photos in books about designers of the early 1900s, like Charles Eastlake, Christopher Dresser, and William Morris. “Layering objects and furniture on top of each other was very common then,” Audry says. Also popular: “heavy, dark, saturated colors, and materials like velvets and damasks, and wallpaper on the walls and ceilings.” Things weren’t just pretty; they were also practical in the early 1900s, when people didn’t have space or money to waste. 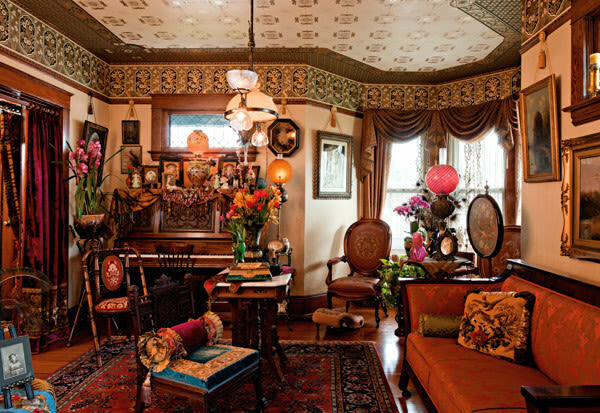 “The Victorians were the original recyclers,” says Chris—hence the quilts made of repurposed scraps of fabric, the heavy wood furniture built to last generations, and even framed art made out of human hair next to their piano. 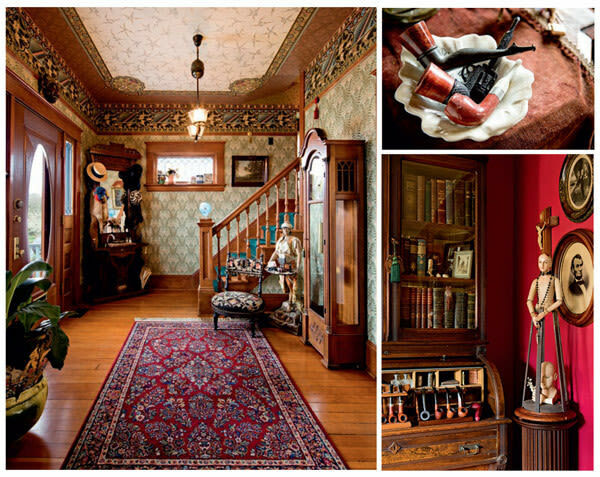 From public spaces like the entryway to the more intimate collections of pipes and first-edition books, everything in the Bonds’ home is an immaculate reflection of Victorian tastes. The living room is a perfect microcosm of the era’s aesthetics: papered in hand-silkscreened wallpaper by Bradbury and Bradbury, with antique-style lighting that provides a dim, flickering effect. A cross-stitched cover on top of a corner chair acts as an antimacassar, protecting the fabric from pomaded (or in modern parlance, gelled) hair, while showing off a lady’s embroidery skills. Even a vase of orchids and framed family photos are indicative of that era. Audry, a talented seamstress, loves the tactility and texture of Victorian decorating, so she sewed pillows and curtains throughout the home. Still, subtle hints of modern life do creep into the house. Audry and Chris work outside the home—he’s a consultant at PGE, and she works in accounts receivable. Though she sews and collects first editions of classics, and he enjoys smoking pipes, he also plays in three bands, and she practices yoga. 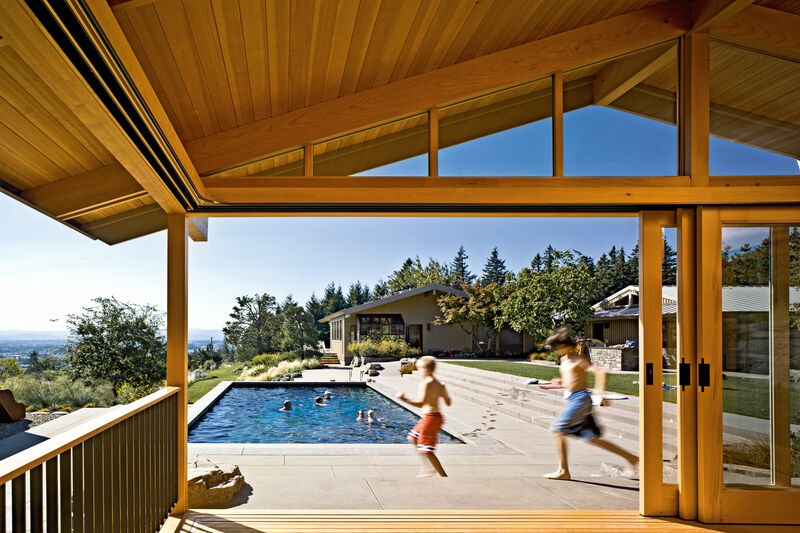 Modern conveniences are hidden in the house, from a small Bose stereo to whole-house air conditioning to a Miele refrigerator tucked behind wood paneling in the remodeled kitchen. 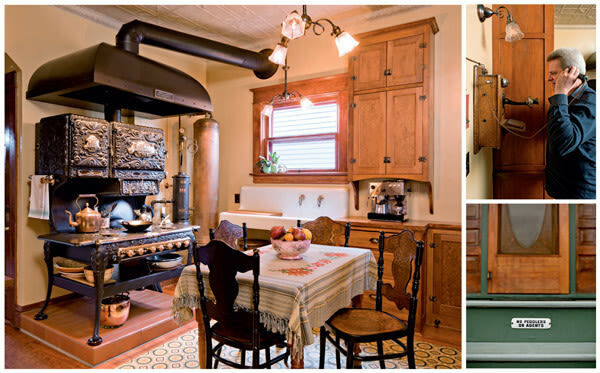 LEFT: The recently remodeled kitchen shows off the period copper hot water tank and a massive stove while hiding a dishwasher and fridge behind custom wood. cabinetry. RIGHT: Even modern-day conveniences, such as the telephone (outfitted with voicemail) and a no-soliciting sign out front, are antiques.